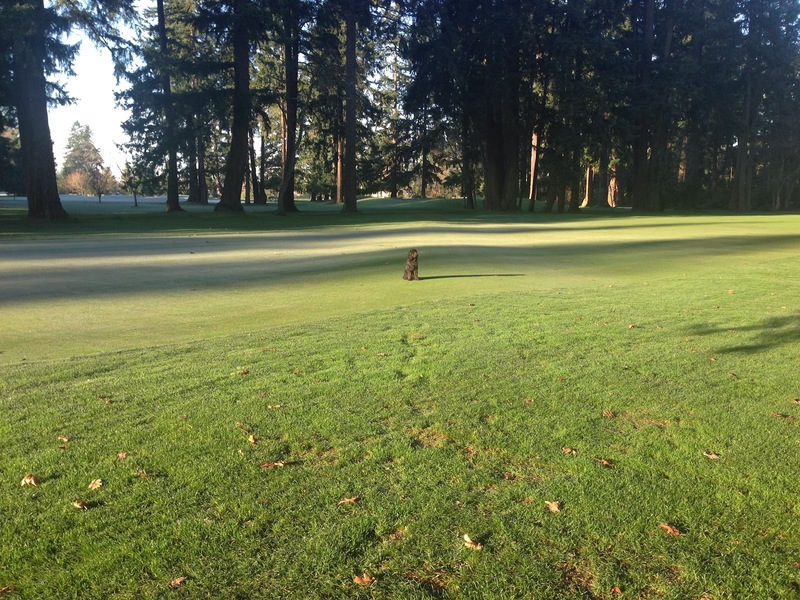 TacomaTurf: What's With the Ditch? 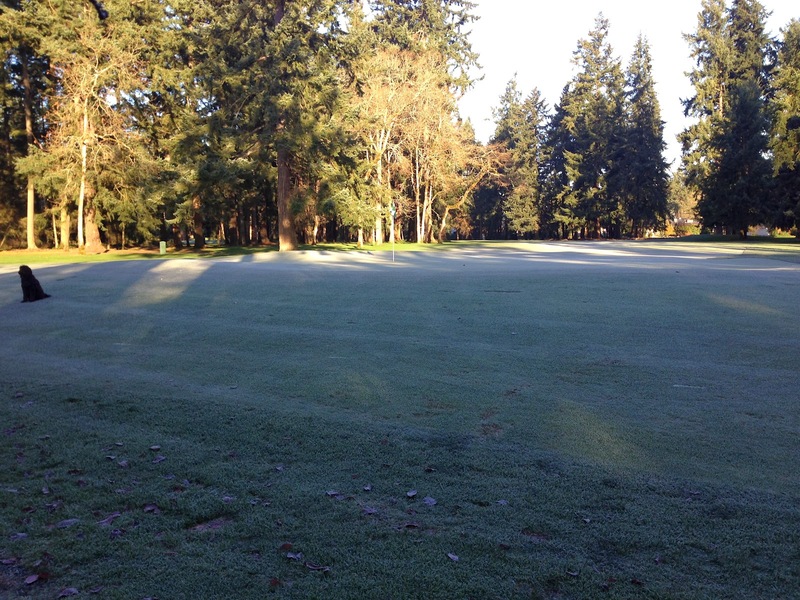 We're in one of those weather patterns with cold, frosty mornings and gorgeous, sunny afternoons. Today when we got to the Club at 6 am, it was a chilly 21 degrees F. Obviously we are frozen solid so we can't just do the normal stuff. We always have an extensive, never-ending list of things to do during these conditions and the project we got going on #2 is pretty exciting. We are running a ditch 24" deep from a utility box on the far left of 2 fairway up to the Turf Care Center (our "shop"). 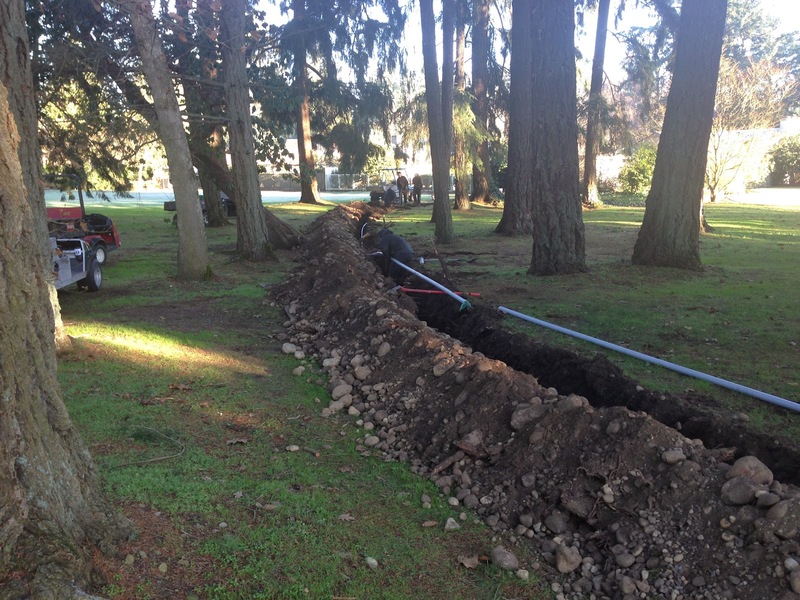 In the ditch we are installing a 2" conduit which will be used to take a communication cable to the Maintenance Facility. The objective is to get a secure cable internet connection. When the Maintenance Facility was built in 1996, the thought of internet access was on the horizon and considered not necessary. Today, we need internet for so many reasons, it's hard to list them all. 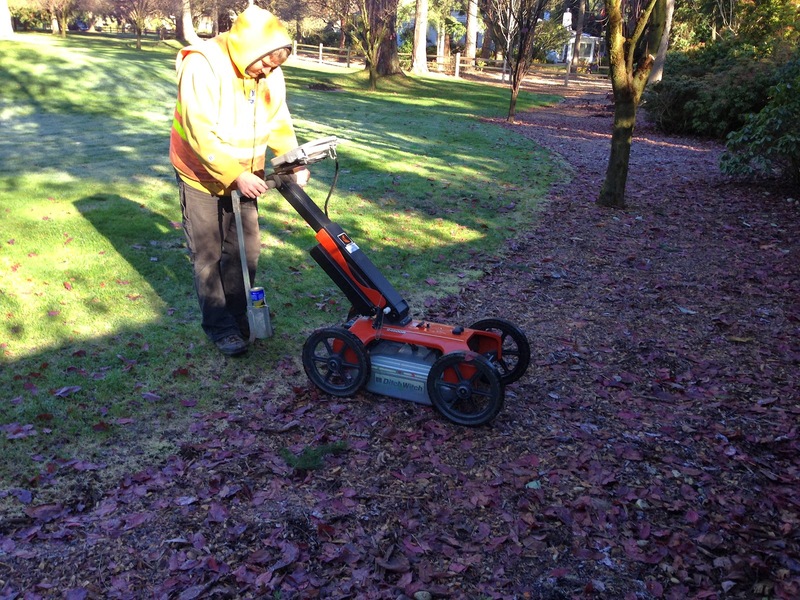 For example, out payroll system and irrigation system depend on the internet. In addition, we cannot take advantage of all the online training opportunities with our current satellite internet because of the slow download speed.. By the way, a satellite internet system is also susceptible to weather conditions. If we have stormy, rainy, cloudy conditions, the satellite gets a poor intermittent signal. Ironically, it's during these weather events that we really need internet so we can monitor the weather to assist in decision making. 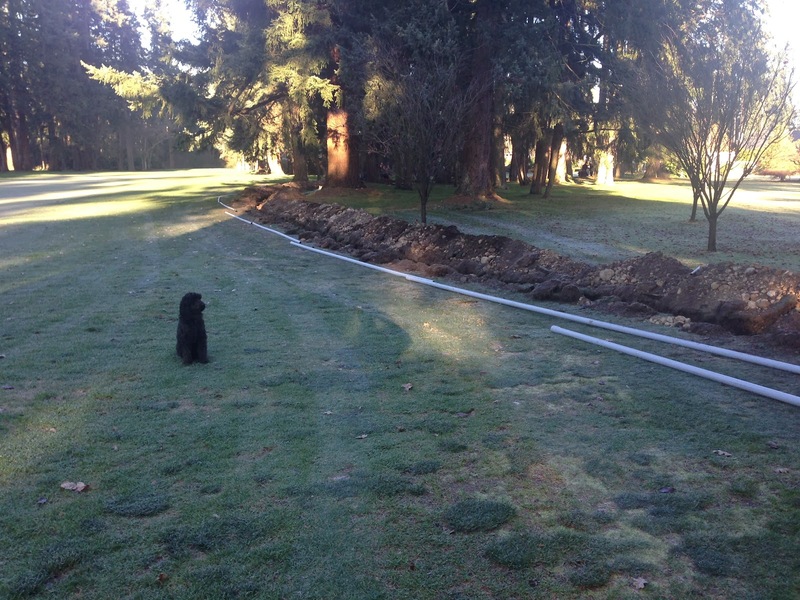 So anyway, that's what's going on with the huge ditch on #2. By installing the cable ourselves, we are saving about $8,000. There some obstacles along the way. 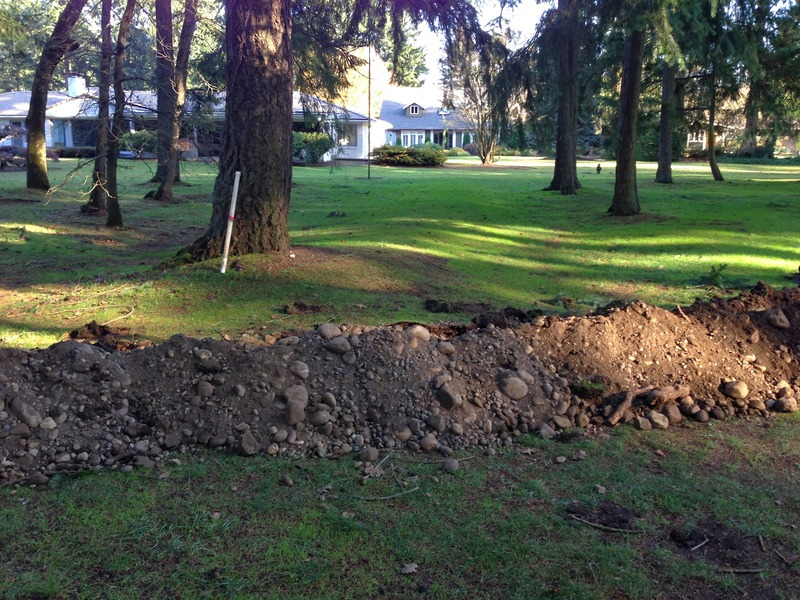 We have to be careful about an existing water and sewer line in the area we are digging. Above you see Tim who came out to help us with locating these utilities using this very cool ground radar device. This was one cool machine. 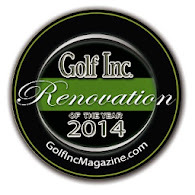 I really could use one considering we have a lot of stuff buried on a golf course that is almost 110 years old. Tim found what we were looking for with great precision and he is now on my Christmas card list since I was really concerned about the location of those pipes. It wasn't really an obstacle but just a point of interest, if you didn't already know this, in the early 1900's a train used to go through what is now the #2 fairway in order to provide transportation service to the Club. Boo is standing right on top of where the rail used to be and there is an obvious berm still there. Looking from on top of the berm toward Forest Glen Lane, you can see where the train once traveled north toward town. It's not real clear in this picture but the soil in the area of the berm is also very different. It's obvious a gravel base was constructed years ago and oddly, even with all the rain we receive, the area under that gravel is bone dry. Some of you I'm sure have noticed this obvious berm and not thought much about it. It's interesting to think about what life was like before the automobile. By horse and buggy, it was a day long trip to get down to the Country Club. That's why they would just stay here for the weekend and camp along the lake and enjoy the whole experience of being far from the hustle and bustle of the city. Or some folks would stay in the clubhouse since the upper floor had rooms for lodging. I imagine the train was a lot faster and had a significant influence on the way people used the Club. It was at that time that people where able to come down to the Club and return home in the same day. Life at the Club would never be the same now with this increased accessibility. 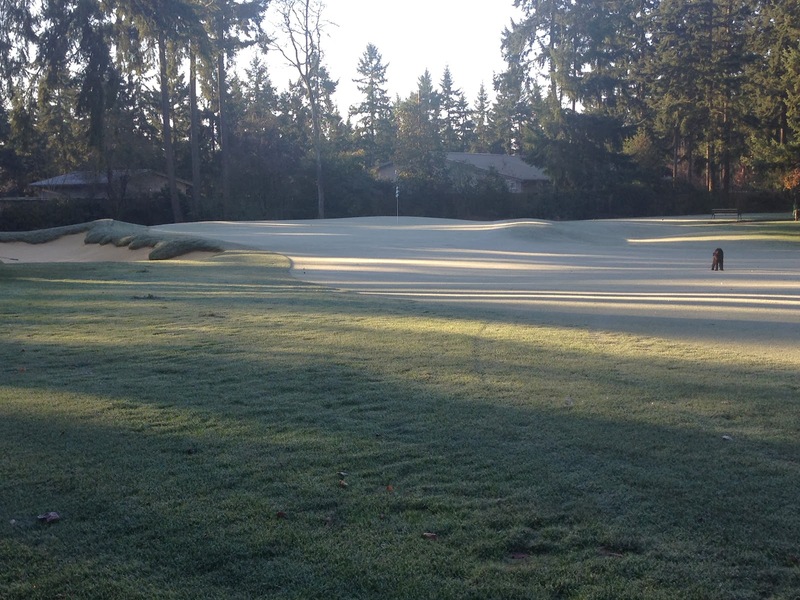 Anyway, I'm babbling, lastly I'll mention that our ditch will pass through the back of the #2 green surround which you see in this frosty pic above. Because of the disturbance the digging will create, the area will be a lot better once we're finished because we will have a chance to remove some shallow roots here and we will be forced to regrade the area, making it smoother and more playable.